eCite - Are input controls required in individual transferable quota fisheries to address ecosystem based fisheries management objectives? 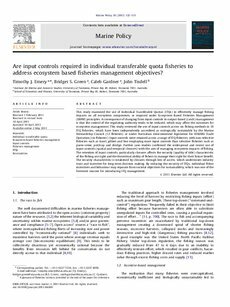 Are input controls required in individual transferable quota fisheries to address ecosystem based fisheries management objectives? This study examined the use of Individual Transferable Quotas (ITQs) to effectively manage fishing impacts on all ecosystem components, as required under Ecosystem Based Fisheries Management(EBFM) principles. A consequence of changing from input controls to output-based (catch) management is that the control of the regulating authority tends to be reduced, which may affect the outcomes for ecosystem management. This study reviewed the use of input controls across six fishing methods in 18 ITQ fisheries, which have been independently accredited as ecologically sustainable by the Marine Stewardship Council (12 fisheries) or under Australian environmental legislation for Wildlife Trade Operation (six fisheries). Input controls were retained across a range of ITQ fisheries, with non-selective fisheries such as trawl, gillnet and line employing more input controls than selective fisheries such as purse-seine, pot/trap and dredge. Further case-studies confirmed the widespread and recent use of input controls (spatial and temporal closures) with the aim of managing ecosystem impacts of fishing. The retention of input controls, particularly closures affects the security (quality of title) characteristic of the fishing use right and the theoretical ability of fishers to manage their right for their future benefit. The security characteristic is weakened by closures through loss of access, which undermines industry trust and incentive for long-term decision making. By reducing the security of ITQs, individual fisher incentives and behaviour may separate from societal objectives for sustainability, which was one of the foremost reasons for introducing ITQ management.